Sometimes a TV show just needs a reboot. I know a lot of people complain about how Hollywood is nothing but reboots and sequels. But I'm not as down on it. How do you know a reboot won't be better than the original? You don't until you try it out. So I'm always excited to hear about a new one coming. Well, the folks over at Crooked Dice are rebooting 7tv. They've got several box sets put together for it as well that you can order. The reboot. While some people say it's the death of Hollywood, sometimes the new version is better than the previous. It's got the same elements as the original, but with some new ideas behind it. Well, 7TV from Crooked Dice is getting a reboot. The new beta version is up online and you can check it out for free. We're half there to back to the weekend. This weekend will be a rather busy one. Tomorrow it's set-up for the CMON Expo and Friday it starts. We've got a lot planned, especially for Saturday. Be sure to check back on that day regularly as we post updates from the various panels that'll be happening that day. If you're interested in CMON's games, you'll want to check back often. But that's this weekend. We're still on Wednesday. Let's not get ahead of ourselves. Right now, we've got another set of bite-sized stories. This batch we have: Forge Prints HD Dungeon Accessories and Bases Kit 1 on Kickstarter, Robot Zombie Cat Card Game On Kickstarter, Crooked Dice release Heroic Archetypes, The Thin Blue Line: Detroit Savage Worlds Module Coming to Kickstarter Soon, Rebel Minis Releases 28mm Earth Force Widowmaker Battlesuits, Adeptus Mechanicus joins the fray in One Page 40k, Several More Installments of The Fiver from The Meeple Mechanic, Heroic Maps New Wardenhale Gambling Den Map, Post Captain Master Index Pt 2. 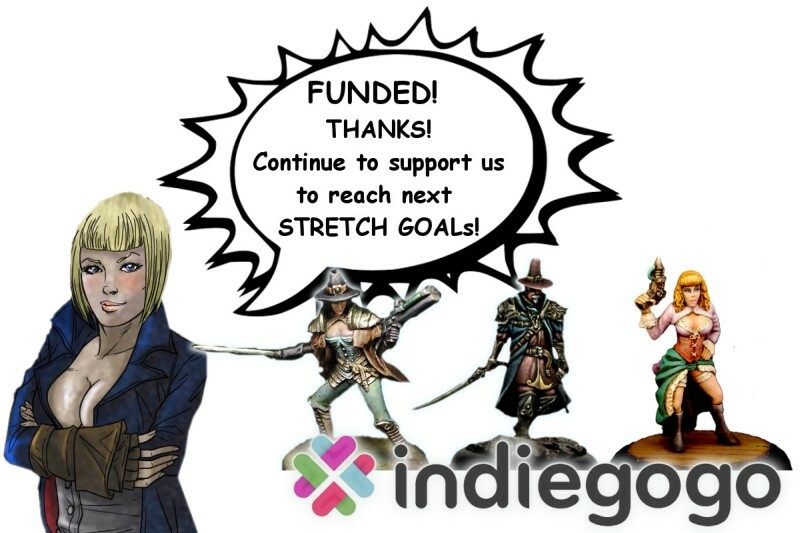 Advance Rules, Another World Indiegogo Funded And now going for Stretch Goals, Sea Dog Game Studios releases Nassau Sloop kit for Sailpower 2.0, New 32mm bases available from Tabletop-Art, Manorhouse Workshop Update #34 – Modular Underground Project – KS launch delayed, "War is Coming" the army game searching for playtesters, Final Days for 12 Realms: Bedtime Story on Kickstarter, Kromlech New Release - Legionary Weapons, Instant Dungeon Tactical Up on Kickstarter, SyrinScape Launches Exclusive Pathfinder Player Character Soundsets, and In-Store Play Program for Free RPG Day June 20, Honour or Death: Icarus Miniatures Preview the Praesidian Honour Guard, Cracked Earth Studios New Tabletop Terrain Line Coming to Kickstarter, Hexagon Mill Terrain Kickstarter Running Now, Legion of Set Artwork Previewed for Conan Rise of Monsters, and Deep-Cut Studio releases a new gaming mat in sand and rock environment. Crooked Dice has their latest releases for 7TV available over in their webshop. 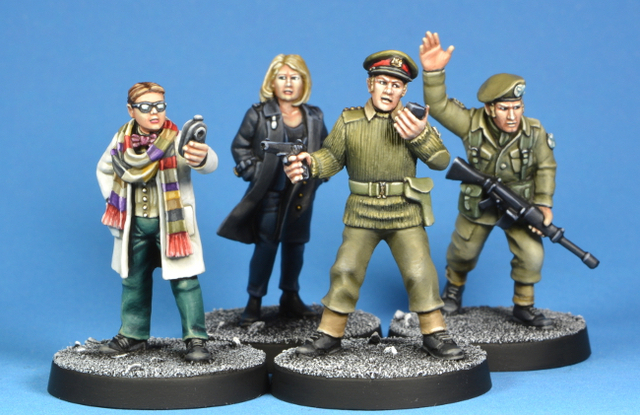 This month's releases include a new deputy and a corporal, along with two scientific advisers. They all seem just a bit... familiar... for some reason, but I'm not sure Who they look like. Also, along with the releases, the Vlad's Army book and cards are on sale for 25% off all month. Crooked Dice posted up their February releases over on their website. This month they've got apes on horses (Planet of the Apes-style), some vicious attack dogs (but we all know they're just happy puppies), and a new set of police officers (or coppers or bobbies, if you prefer). 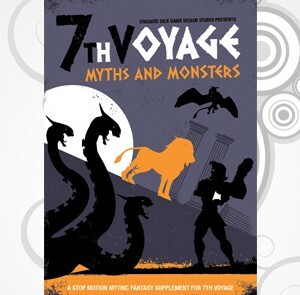 Crooked Dice sets seas for high adventure with the release of their Beyond the Seven Seas expansion for 7th Voyage. 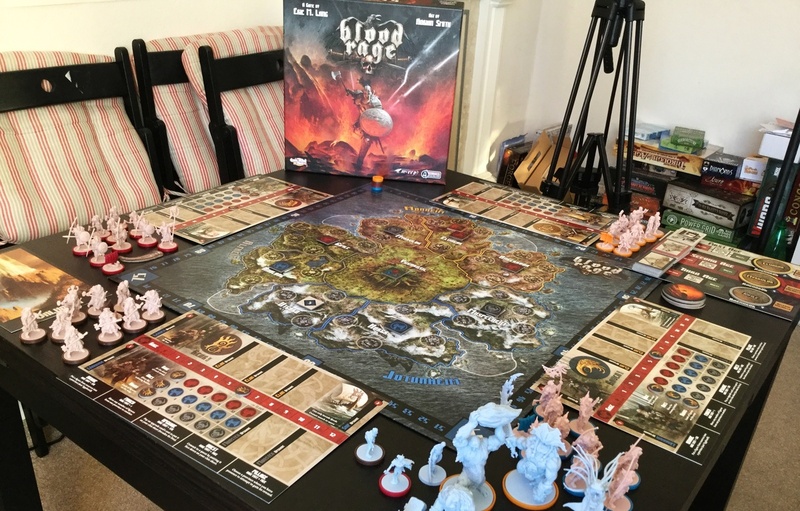 Game in the Hollywood-inspired settings of the New World during the age of exploration, or take on Mediterranean pirates, or go and visit Singapore. ... basically, do a lot of stuff like in the Pirates of the Caribbean movies. Maybe you can be the reason why all the rum is gone. Crooked Dice has released their new Chronal Commandos just in time for the holidays. Though if they were real Chronal Commandos, they'd be able to be released any time they wanted. But the minis are pretty cool on their own, too. The set of minis includes Crooked Dice's 200th model, which is a pretty cool thing to celebrate. Go check them out. Crooked Dice has their latest 60's action set available to order over in their webshop. This time it's Danger 5. Crooked Dice Game Design Studio are proud to present this DANGER 5 box set. It includes: eight white metal 28mm scale models sculpted by Ernst Veingart; a booklet of profiles of your favourite heroes and villains for use in our 7TV rules; and some exclusive DANGER 5 dice. Crooked Dice gives you more programming options for 7TV with their latest releases. Lots of new releases this month. We have our new Solomon and King models plus 4 X-Commandos to bolster the Department nicely. Then there is the Argonauts Starter Set to stop them getting too complacent. Also released are 2 new Daughters of SHIVA, then Köhner joins the ranks of SHIVA with old pal Bolo. We have a resin Transit Van, with optional police siren & light, and a sprue of more Minion Weapons. 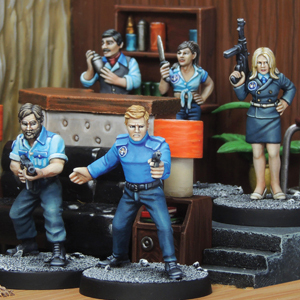 Crooked Dice has their new ARC Moonbase Crew available over in their webshop for January. We lift off into the new year with five more models from the Albion Rocket Consortium! 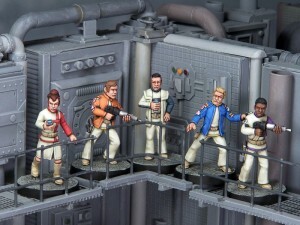 The ARC Moonbase Crew are available for £3.25 each or £15 for 5. Buy the deal and grab all 6 of our other Astronauts for £10 in our January Deal of the Month. Crooked Dice have posted up their December releases over in their webshop. Plus add some Repair Drones to your Argonaut casts. Crooked Dice has their November releases now posted up on their website for you to check out. Loads of releases this month! First, the metal: The Guru (new sculpt) and Kali for £8 are all villainous here. Four Cultists for late night rituals, hire them for £12 here. Two deals of four Savage Schoolgirls, suitable for zombie horror or other survival genres, at £12 per deal here and here. Then we have the print version of the Villain Programme Guide, which combines the individual S.H.I.V.A., Argonaut and United Radionics Programme Guides. £20+postage, here. I will add the PDF versions and the 2 page PDF update featuring new rules for Bolo and the all new S.H.I.V.A. Destroyer (coming soon!) err… soon. AND if that wasn’t enough, if you spend £60+ on miniatures and/or PDFs you can get 10% off with the code ZOMBIEMILEYCYRUS. Crooked Dice has some new Robo-Minions available over in their webshop. Rosie the Maid they are not. Robo-Minions are Ulysses Argo’s expendable minions. Captured humans have various technological enhancements grafted onto their bodies, while their brains are partially robotised to obey Argo’s every command. They are sent in to back up his other more reliable metallic creations. The Deal comprises one each of three models, with mix and match arms, plus one sprue of three heads and one sprue of Disruptor guns for £10. The headless bodies with arms are available separately from the drop down menu below, and the ?Heads and ?Weapons are also available as part of the5 for £7 Deal. Crooked Dice has posted up their new releases for the month as well as they're having a sale going on their pdf files. This month Crooked Dice add some more Minions to the growing ranks of goons. Sculpted by Mark Evans and converted by Ian Mountain, there is a Minion Leader and Administrator and a HMG crew. Plus Ian has sculpted two new head sprues to give even more variety to your 7TV forces with some Balaclava heads and some United Radionics guards. Plus there are TWO Deals of the Month! 50% off ALL PDFs! This applies to all PDF-only products (except 7th Voyage, which has 25% off) on the site during September, check them out here. Remember if your cart contains only PDF products, you will get your download links immediately. 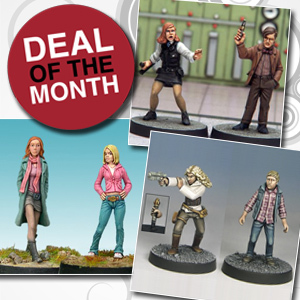 The second Deal of the Month is a FREE WPC May Killan with every miniatures order they receive at Dice Volcano HQ during September. Crooked Dice now has their August releases available over in their webshop. Our new releases are out! You can get investigators Tweedy 2 & Belle (£4 each or £7.50 for the pair) and boisterous temp Ms Temple (“Oi!”) from our Store (£4) right now. Plus our August Deal of the Month is the excellent ARC Explorer bundle. £16 for £25 worth of models. Crooked Dice has a lot of new stuff to offer this month over in their webshop. Check it out. Lots of new rules and lead from Crooked Dice this month. July sees a raft of Federated Security Reinforcements available in Store: The Commander (£4 including balaclava and helmet head), two female Mutaints (£3.25 each or £6 for both) and the Security Robot (£6). Get them ALL in a great Deal for only £15. The Commander is back again in July’s Deal of the Month leading 9 Federated Security Troopers (3 each of 3) for only £22 – that’s saving £7.50! And lastly, you can get a sprue of 3 Federated Security Carbines for £1.60. These are also available as part of our 5 for £7 Deal. This 44 page PDF details everything you need to know about Ulysses Argo and his mechanical creations. Fuelled by a deep hatred of humanity, Argo uses his robotic minions to wage war against mankind. The rules, background, behind the scenes info and stats are all here so you can get them into 7TV without having to know all that annoying machine code. Crooked Dice released their new models for this month, as well as has a special deal going on. 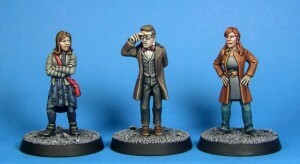 This month Crooked Dice have three 28mm time lost travellers available: Eliza, Victorian Samurai; Sachs - a mutated manservant; and Genevieve - a martial maid. Eliza and Sachs come with human head on the tab PLUS an alternate Saurian or Toad-face head for variety. Plus in the Deal of the Month, you can pick up Tweedy Mattison, WPC May, Daisy Taylor, Casual May, Action Melody and Wiliam Killan for a bargain £15. Crooked Dice has released more models for their Sinbad line over in their webshop. The Princess and the Wizard – which sort of speaks for itself. 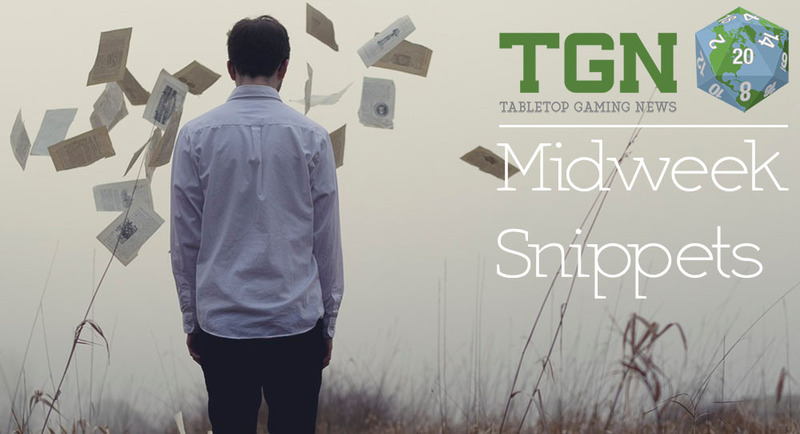 Crooked Dice has announced their new line of miniatures, Grandville Miniatures, coming soon. Crooked Dice are pleased to announce our collaboration with Ocelot Games to stock their new range of miniatures based on Bryan Talbot‘s acclaimed Grandville graphic novels. Elegantly dressed humanoid animals, steampunk technology, romance and violence abound in these sumptuously drawn tales of intrigue and adventure. Grandville Miniatures are a range of 28mm scale figures from Ocelot Games suitable for fans of the books, steampunk devotees and wargamers. The first figures of intrepid Detective Inspector LeBrock and Sergeant Ratzi of the Yard, are nearing completion. Sculpted by the talented Jo Brumby, the final metal castings should be with us in time to sell at Salute on April 20th (ExCeL, London) on the Crooked Dice stand (TB07) and will be available in the Crooked Dice web store in the following week. Crooked Dice has added more Future Freedom Fighters to their webshop. Go and make sure the future is a safe one. Crooked Dice have another 5 retro Future Freedom Fighters to get in the way of the plans of the Federated Security. Both deals have one male and one female Future Freedom Fighter, with FFF3 also containing the Oracle super computer (unbeaten at Tetris!). Let us know if you want these combined shipped with any outstanding orders you may have, or if you want to collect at Salute.